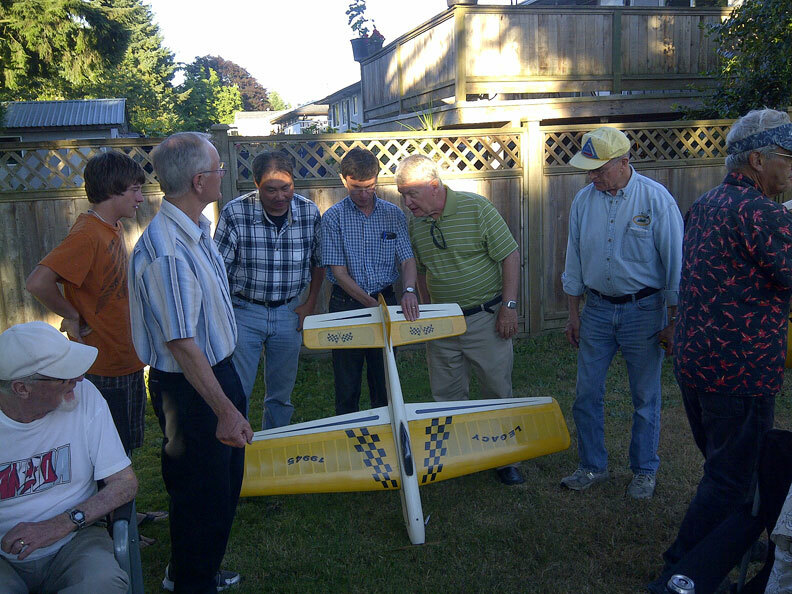 "Aircraft Alignment Experts" study Rex Abbott's Legacy at the Cox household barbecue during the Western Canada Stunt Championships. Chris Cox photo. 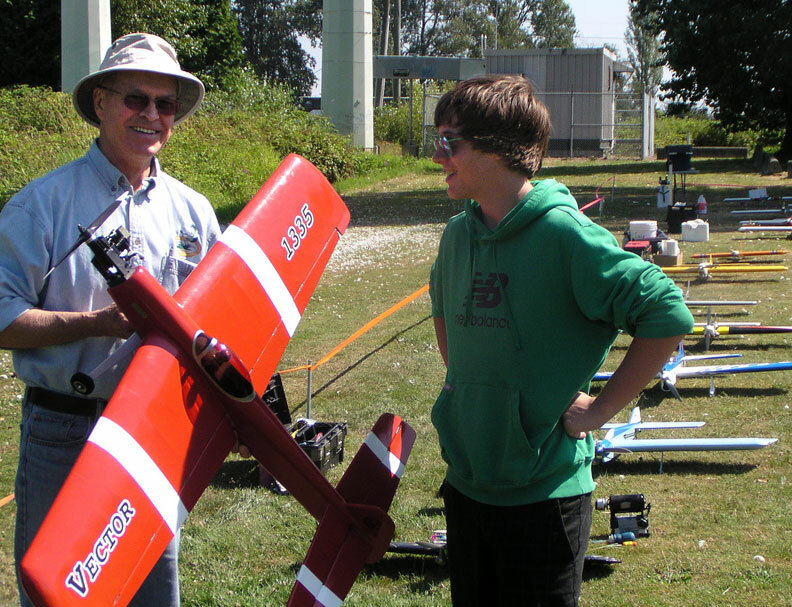 July 20-21, 2013, Richmond, B.C. The weatherman was very good to us again this year. The attendance was down a little bit this year, no doubt due to the date, which coincided with the finish of the AMA Nats. 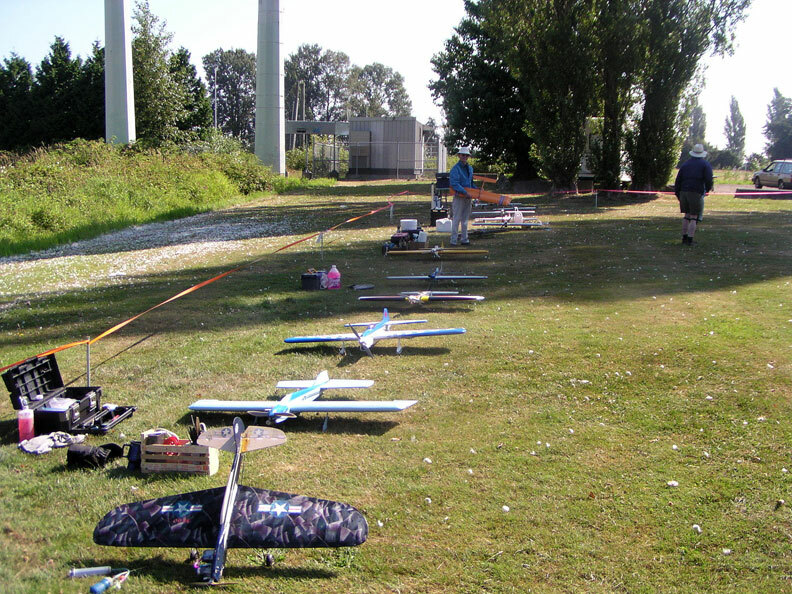 We had four beginners competing, including one junior who came from Sequim, Wash. This is no doubt a very good omen for the future of the sport/hobby. One of the new flyers came all the way from Calgary, Alberta . Highlights of the weekend included the barbecue at the Cox family residence with a plentiful bounty of good food and drink and comradeship. To see how fun and food and drink can turn ordinary stunt grunts into "Aircraft Alignment Experts" check out the attached photo above, which was taken by Chris Cox during the Saturday evening festivities. This year the lunches where whipped up by Dave McCheyne and Cindy. This was well appreciated by all. Warren Horbachewski with his Nobler. Rex Abbott photo. Saturday pit lineup. Rex Abbott photo. 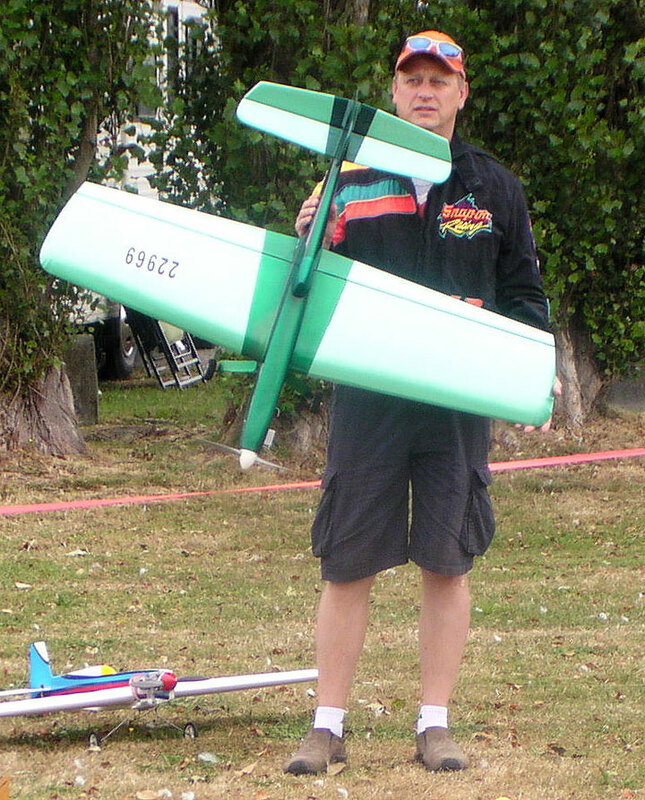 Bryan Carr with his profile model. Rex Abbott photo. Pete Ferguson in flight. Rex Abbott photo. Hube Start (left) and new flier Oliver Lawrence. Rex Abbott photo. 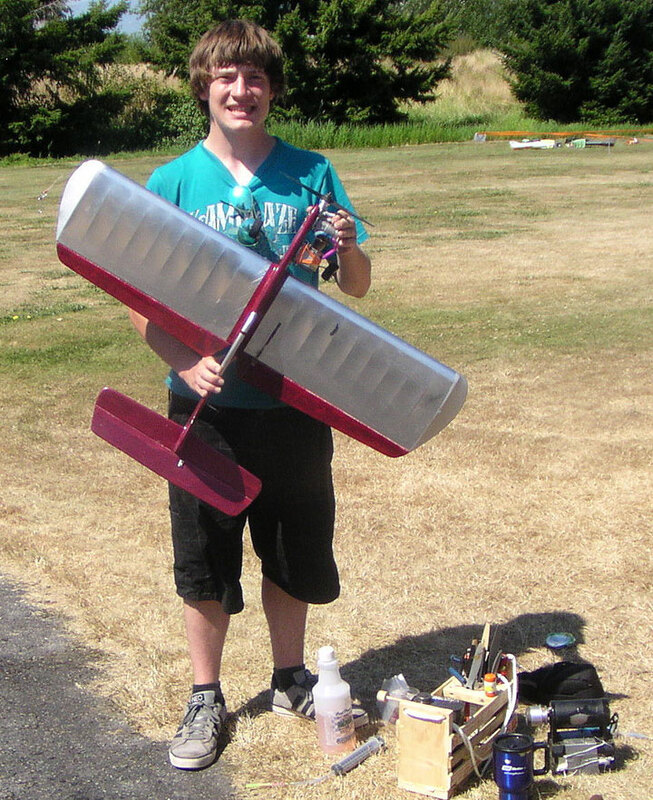 Oliver Lawrence and his plane Rex Abbott photo. I took Ollie to Canada last weekend and he scored a lot higher than anyone else there; it's just that ge didn't know it. The story starts three years ago when I took him to Chehalis to observe Combat flying, since I think Stunt is a bit boring for teenage boys; girls may be able to do it. I picked up a couple H&R bellcranks, thinking Ollie could become my sparring partner in order for me to lose to Jeff Rein/Don Mckay gracefully (ha!). He learned to fly level laps in a hayfield with my Peacemaker and OS .15. The Peacemaker lost while Ollie was learning which way the wind blows and what it does to CL planes that do loops UPWIND! At the Nats, I took a second in Beginner and one of the many prizes was a Carl Goldberg P-40 CL plane that I gifted to Ollie and subsequently helped build. After a couple of uneventful flights on short grass with my trusty FP .25, Ollie hung the plane on the wall and started chasing girls (they're probably more fun!). Now all I have to do is teach her how to fly stunt and she'll probably beat him at it. Last summer we didn't fly at all and I hired him to mow my lawn while I went to the Brodak event and visited relatives back east. At Christmas he rewarded me with a hand-made sanding block that is the jewel of my model airplane workbench. In the fall I visited Jack Reynolds (a lifelong friend) who was suffering from cardiac problems and as a result, he gave me his prized Veco Chief complete with K&B .40 as well as a Sal Tibi Starduster kit still in the box (really nice RC conversion possibilities). I gave Ollie the Chief and we stumbled through getting the old Veco to run on a test stand for several hours before I came to the winning combination. As you know, I built an AA Sr. for the Canada event and for a backup engine I double-drilled the plane to accept the new-in-the box OS .25 (rear NVA) that I've had sitting under my bench for 2 years. When Ollie's ST .51 spraybar checknut gave out, we switched engines and got him back in the air with my OS .25 and the venturi insert from his engine to get the lap time above 3.95. Needless to say, an attempted outside loop put and end to that great save. This was Friday at practice. No problem, we had dinner and went out to fly the Chief with a brand new APC 12-5 prop and had a once-in-a lifetime experience. The cotton hinges in the chief gave up on the starboard side and Ollie learned to hold onto the the plane while he flew ragged laps with one flap literally flapping in the breeze because it was still attached to the horn. At first I thought the top block had come loose! Lucky it didn't flutter and destroy the control system. Before settling into bed, I put some of my trusty dacron hinges over the flap of the Chief with Sigment while Ollie held the flap immobilized as the glue set up. The next morning I came the the realization the the port flap had only 2 working hinges that weren't broken, so we went back into Sigment and hinge mode one more time. 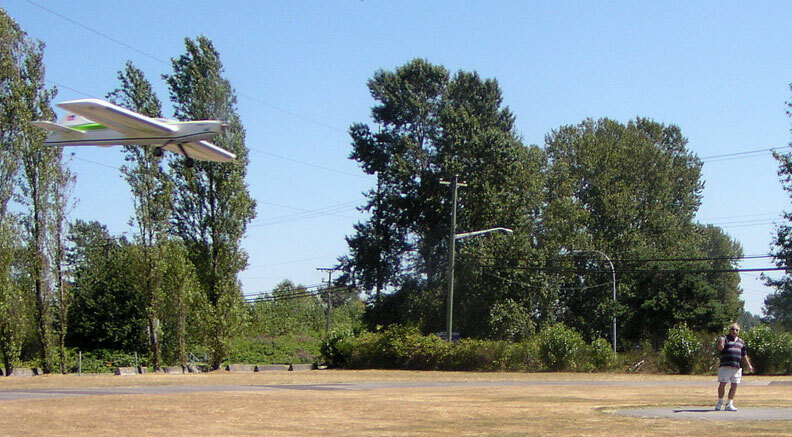 Chris was leaving for the contest when I asked him if anyone ever flew the Clown hanging on the garage wall with the covering missing on one bay, and, as it turned out the plane belongs to the Dragonlady and she allowed it to be taken as the third backup plane if the Chief failed. Chris is such a great host that he would even give you the shirt off his wife's back (joke)! On his way up the stairs, Chris picked up four mounting bolts and a trusty bottle of CA to fix the tail feathers on the P-40 and asked if I need more mounting nuts (which I declined -- fool !). The P-40 tail feathers were articulating properly under the direction of Dr. Cox. After he left, I doubled the severed limbs with my trusty Sigment and polyester hinge material. To me there's nothing that beats Oklahoma fiberglass. Rushing to the contest site we arrived 3 minutes late for me to fly OTS, but the CD had forgotten to print OTS score sheets as OTS is a relatively new event in Western Canada. This gave us time to test fly the Chief repairs, but we had buzzed the prop the day before and I had to revert to one of my choice Rev-Up 13x7's for the Legacy. 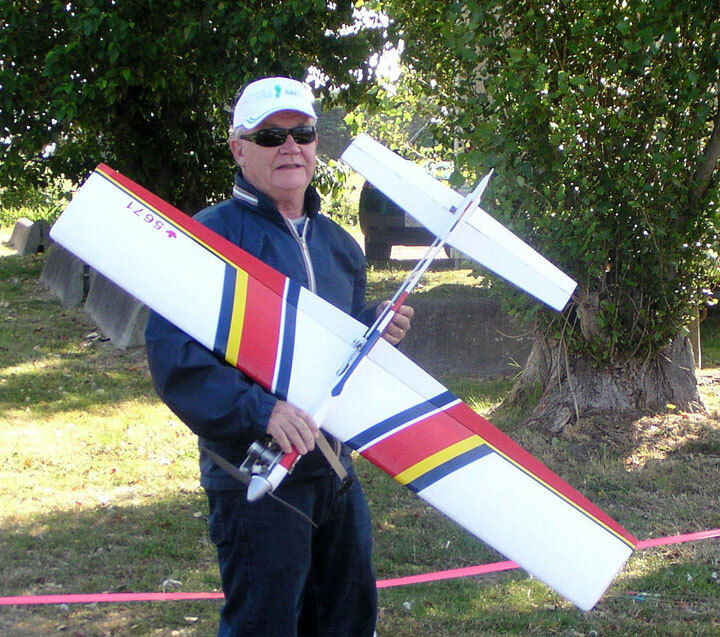 The K&B .40 pulls that prop like a mule with half of the venturi plugged with balsa sticks! Chief. No problem, steal the mounting nuts from the Chief and get the P-40 engine mounted with Chris' screws. Does anyone in the house have an APC 9x4? (Yes --- but it is at home). So, we carried on with a Master AS Scimitar 9x5 to discover that the spraybar checknut was stripped in the outside loop event. Using the NIB OS .25 allowed us to be ready for the next day without needing to use the third plane. Needless to say, after the banquet was over Chris told Ollie not to try any outside loops until he had one official flight nailed down. Sunday morning was supposed to be a piece of cake until "Wrong way Corrigan" took control of the RV and I didn't notice it until the U.S. border was fast approaching. Oooops. Beginners start first as well. All I could hope for was that they would score him as a "bye" and he'd at least get the second flight -- eh! I never managed to get a picture of Ollie flying the plane; IRONIC! Ollie found a 4-leaf clover four minutes before he was to fly. Super Clown (scratch built plane) in good working order. OS LA .40 with venturi missing (good compression - however). Kieth Varley provided a Junior trophy.